Because many of the readers of this portal know very well Tanya Colesnic, I thought proper to put some pictures from her wedding with Ajay, that took place yesterday in Katmandu, Nepal. In January, Tatiana and her friend and colleague, Valentina Stepaniuc, came in Nepal for four months to prepare a group of English teachers from this country for teaching this language according to the method of EFNL (English for a New Life) book. 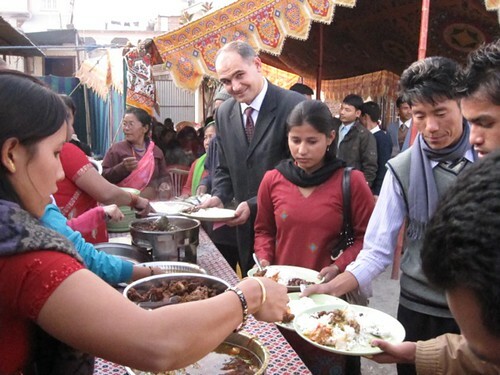 Among their students was Ajay, who is also a student at the Inductive Bible Study Institute from Nepal and administers an orphanage, where he takes care of 17 orphan children. Yesterday, December 11, 2009, the wedding of Tanya and Ajay took place and I had the joy and honor to be with them and to officiate their wedding. 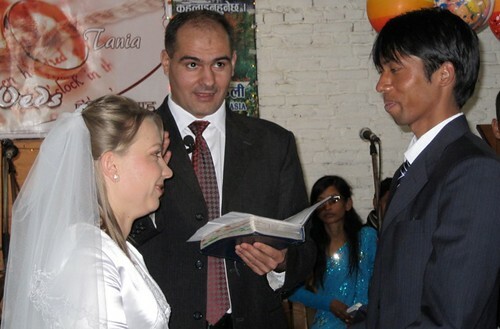 The wedding took place in the church SARA, where the pastor is Tej Bahadur Rokka and there were many guests who were very happy for the marriage of Ajay and Tatiana. Then, all of us were served with a lot of good dishes. All those who came to share the joy of Tanya and Ajay brought good wishes and beautiful gifts. Here, at the comments, I want to give the opportunity to all friends of Tanya to write their congratulations. I also urge you to always pray for the mission ministry that Ajay and Tanya have to do henceforth in this country.